Am cutting away in my studio but nothing much to show up here yet. And now it's starting to get dark. Miserable day. So, so busy right now - with studio stuff and uni things. 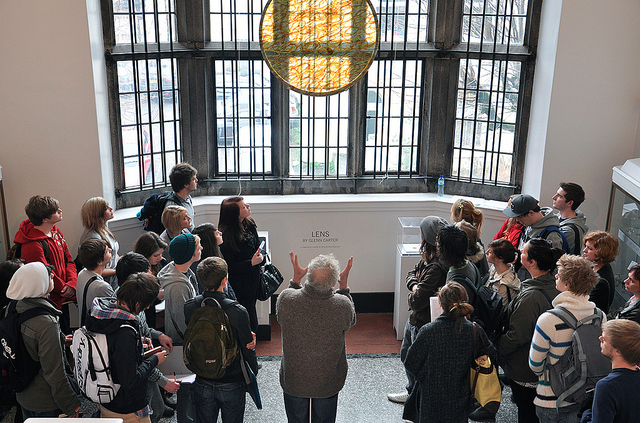 Took my UoP first years to Plymouth City Museum & Gallery yesterday. They're designing a piece of promotional material for Lens, the glass piece in the window. That's the artist, Glenn Carter talking to them. 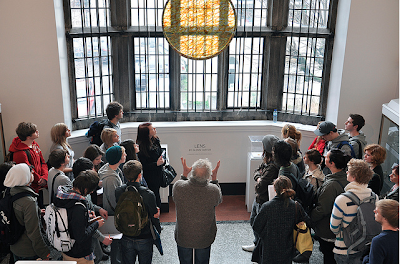 That's also me, notes in hand, with the yellow bag, nicely picking up a similar tone to the stained glass. I do so like to colour coordinate (In this photo you don't get to see the delights of my fluorescent yellow tights). If you could see my face I'd be looking very earnest. It's my museum face. I get a lot of stick for it.